AKA Super Easy Quiche that you can fill with any ingredients you want! YAY! This weekend, a couple of my girlfriends gathered for a bunch at a friend’s house. Let’s just say we were there for about five hours, and it was glorious, girly time. 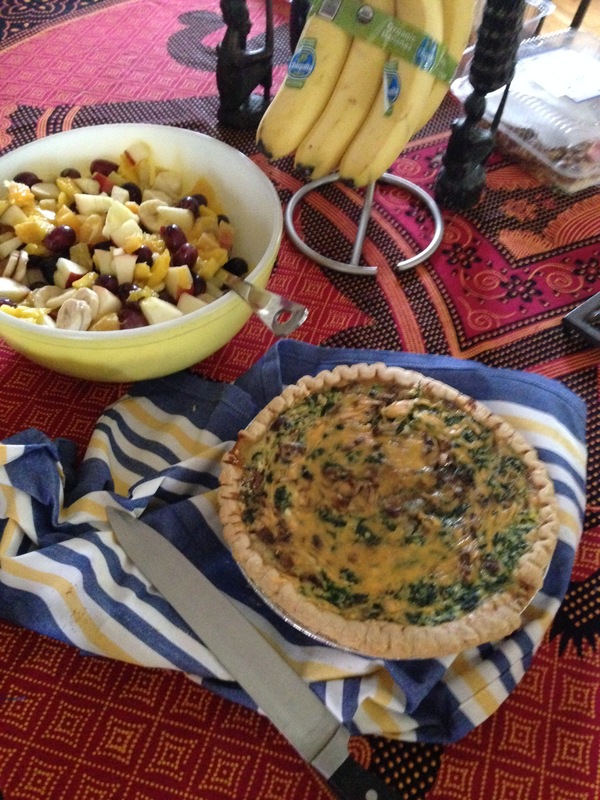 And my hands-down favorite brunchy food is quiche (well really, anything with eggs, but quiche definitely covers that). There are a million recipes out there, so I kind of just made one up, and I’d say it turned out quite nice. First off, I pretty much ALWAYS use a store-bought crust. They are delicious, and let’s be real…no one cares. I recommend a frozen deep-dish pie crust…you know, the kind you buy that’s already in the foil tin, and usually you have to buy two which means WOOPS more quiche next weekend please!! Anyway, here you go. You can always substitute any meat or veggie you want, but I was really happy with the flavor on this one…enjoy! CHEESE. Optional, and the amount/type is totally adjustable. salt, pepper, garlic powder, and any other seasonings you are partial to. Thyme would be good, but I did not have any on hand. 1. Preheat oven to 350 degrees. Saute onion in olive oil until it begins to brown and become slightly translucent. Add mushrooms, and cook for a few more minutes until they begin to brown as well. Add in spinach and mix well. Take off heat and let it cool off a bit. 2. In a medium bowl, combine eggs, milk, and seasonings: Beat well. Also add in about 2-4 oz of cheese. I had a bit of feta left in my fridge, so I threw that in with a little shredded cheddar. 3. Stir about 1/2 of your onion, mushroom, and spinach mixture into your eggs. Pour this into your pie crust, and then slowly add as much of the remaining vegetable mixture as you can. You may have a little left over, but I think it’s more important to get all the eggs in there. 4. Bake for about 40 minutes before checking it. It will likely still jiggle a little in the middle. Add a sprinkle of cheese across the top, and bake another 10 minutes, or until the middle no longer jiggles. I also recommend placing your quiche onto a sheet tray, since you’ll likely get a little overflow, and you don’t want to bother cleaning your oven later! 5. Let rest at least 20 minutes. You can serve at room temperature, or even cold. I’m a fan of warm/room temperature…To each his own!